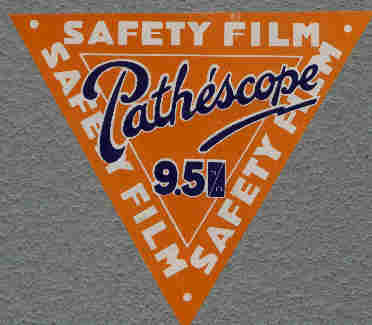 Pathéscope were the UK subsidiary of Pathé-Baby in France who were responsible for the initial introduction of the 9.5mm home movie cine gauge in 1922 (launched in the UK the following year). After an abortive attempt at optical sound on 17.5mm in the early 1930's, optical sound on 9.5mm was launched in France in 1937, followed by a UK launch early in 1938. Unlike 17.5mm sound, the 9.5mm optical sound sytem was an immediate success - prices were much lower, there was a deluge of shorts and features plus Betty Boop and Popeye cartoons - all available for outright purchase or for hire from film libraries. 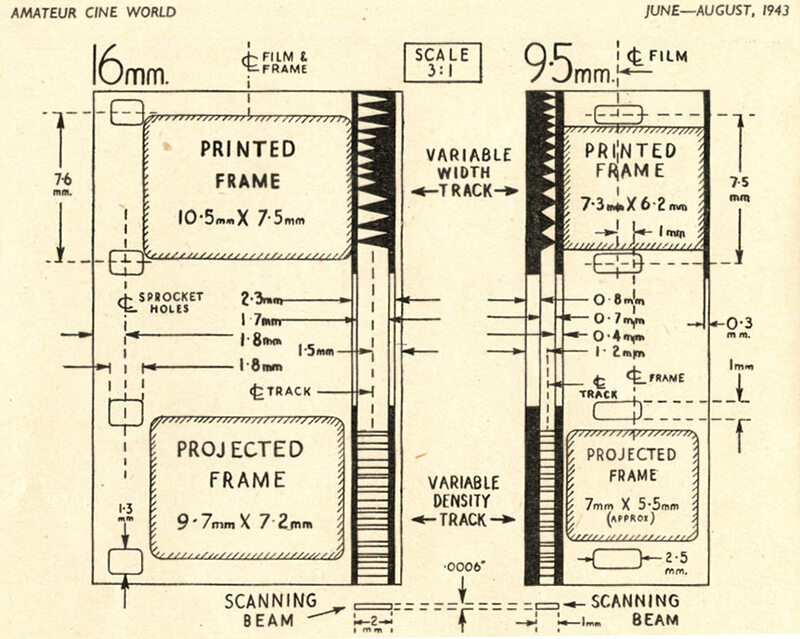 9.5mm and 16mm optical sound film specifications - note the 9.5mm optical sound track is just 0.7mm wide! Unfortunately the second world war did terminal harm to 9.5mm - 16mm was the gauge used for war filming and entertainment. After the war Pathé-Baby and Pathéscope continued valiantly with 9.5mm optical sound film releases, including a few top class titles, but sales were low and by the mid-fifties only a trickle of new releases appeared in the UK - Pathéscope said they lost around £600 on each feature film they released. 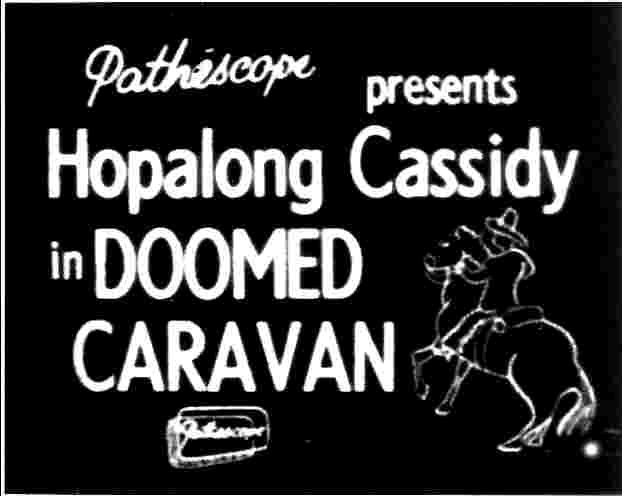 The last release was announced for December 1959 ("Doomed Caravan" - a Hopalong Cassidy western) - sadly the Pathéscope company went into liquidation in 1960 and although a new company Pathéscope (London) Ltd was formed, there were no more Pathescope 9.5mm optical sound releases (but see the Novascope film catalogue). Pathéscope supplied the 9.5mm optical sound films in multiples of 300ft ('1 reel') which runs for around 8.5minutes at 24fps sound speed. These were prefixed T. - presumably 'talkie'. 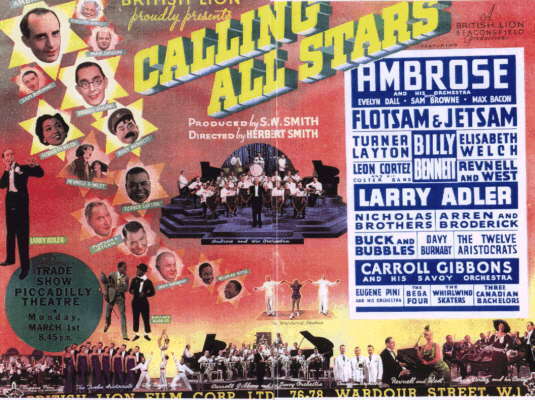 A small range of 100ft musical shorts were also released - these were prefixed CT. (the 'C' was already used to refer to 100ft silent 9.5mm releases - 'C' is 100 in latin numbering). 9.5mm optical sound films of over one reel, were generally supplied, ready joined, on 900ft spools, meaning most features arrived on two or three 900ft spools. 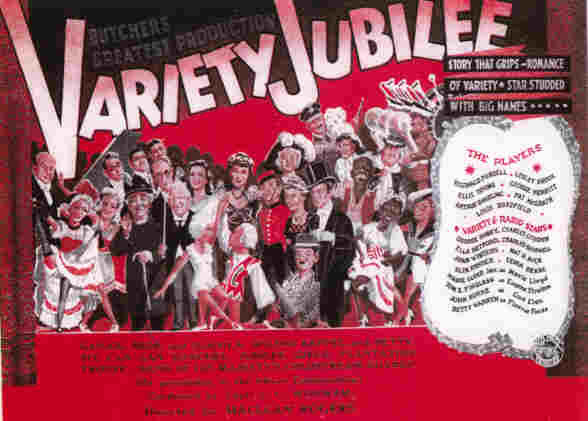 "Doomed Caravan"; "Down Among the Z Men"; "The Eagle's Brood"
"Swiss Miss"; "Tomorrow We Live"; "Too Many Women"; "Variety Jubilee". Limited"; "The Rocky Horror Picture Show"
18Feb2011 - A few titles updated / 09Sept2013 "Whatcha Know Joe" changed to "Watcha Know Joe"